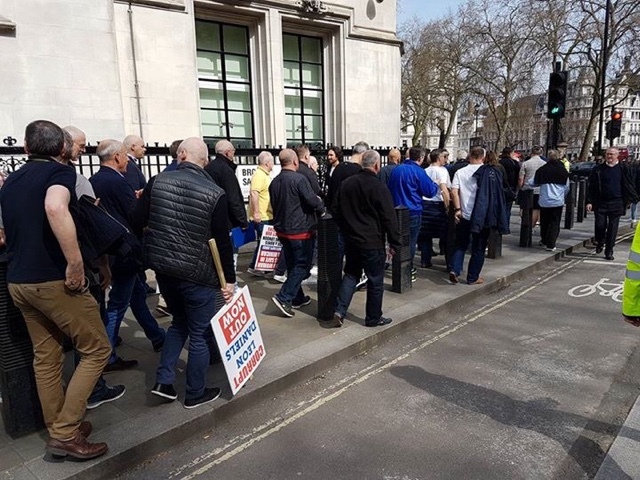 Yesterday morning the driver lead Taxi group, the Independent Taxi Alliance (ITA) called an on the foot demonstration in protest of the corruption highlighted in the national media this week. Both the Prime Minister and then Chancellor leaned on the previous mayor Boris Johnson to go easy on the American Internet platform based app Uber. Boris then leaned on TfL who, instead of enforcing the legislation -as they do with licensed taxis- relaxed the regulations to allow Uber to get away with murder. In light of the atrocities from last weekend, it was felt necessary not to put pressure on the police, by blocking the streets and upsetting the general public. It was felt an on foot demo would be the most appropriate form of demonstration. 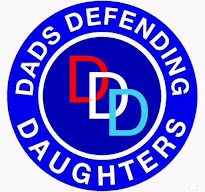 The ITA, were fully supported by drivers of the militants Dads Defending Daughters group and the night drivers Mayfair Mob. It was a tremendous turn out with rank and file drivers from all orgs and unions, sporting lanyards of every colour. The protest started at the Tory HQ in Mathew Parker Street. Virtually every attendee was handed a banner, paid for by a collection from DDD and MM members. 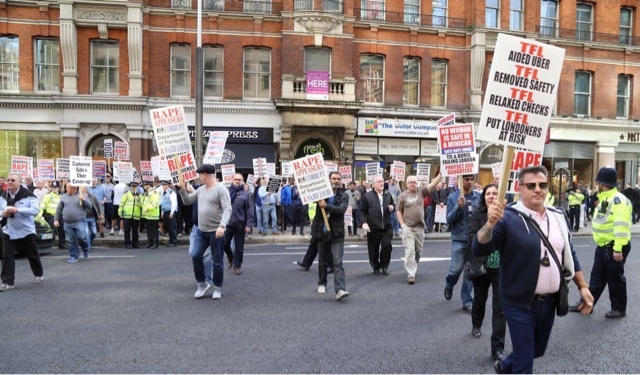 The group then headed towards Victoria and made their presence felt outside TfL's main HQ, Windsor House. 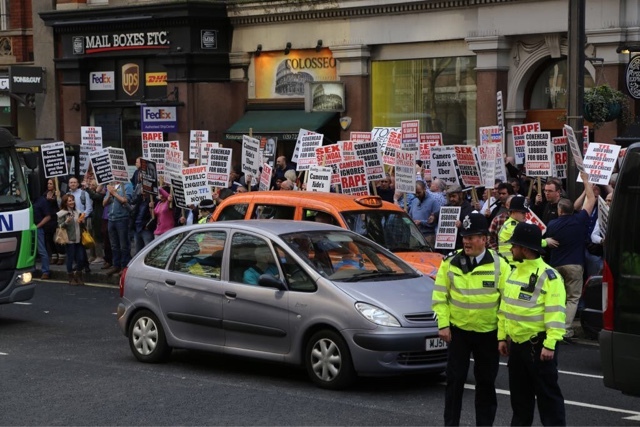 Drivers shouted up at the Windows "We want Daniels out"
The group then marched along to Downing Street. As a mark of respect, when the group entered Parliament Square, banners were lowered and the group marched along Whitehall in silence to Downing Street. 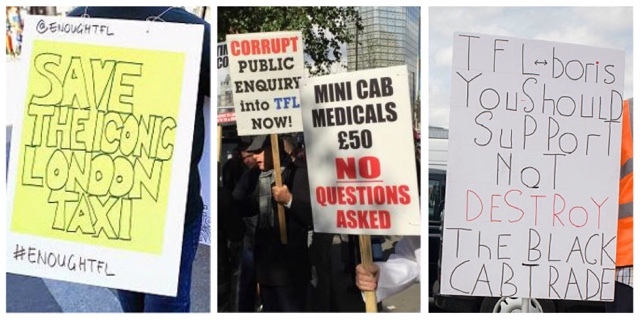 The placards and banners let everyone know exactly what the drivers were protesting about. It's ok having a drive in, but if no one knows why your there, it's a waste of everyone's time. The group then made there way down across the foot bridge and over the river, on towards Palestra. Despite another orgs attempts to belittle the protest, on social media, it was a major success and attendance (always hard to attract on foot) was better than expected. 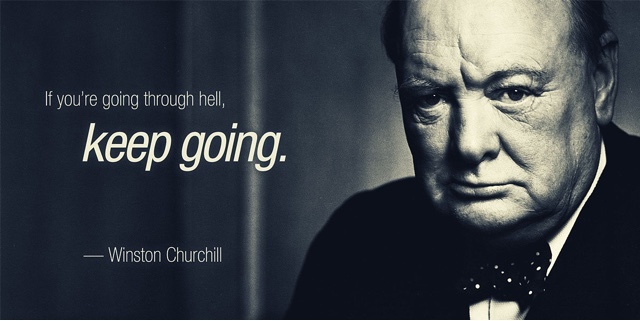 We are the masters of our own fate, let's not drag defeat from the jaws of victory. 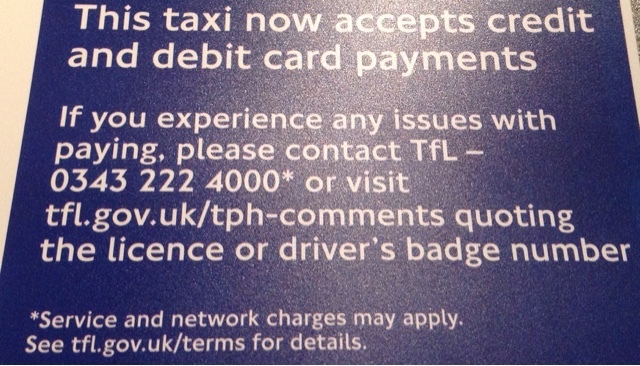 Don't force people to tap and go, banks are told by watchdog... TfL Ain't Listening ! The City watchdog has told High Street banks not to force customers to use contactless cards amid growing fears about fraud. Do you think TfL are listening ..... Don't hold your breath. 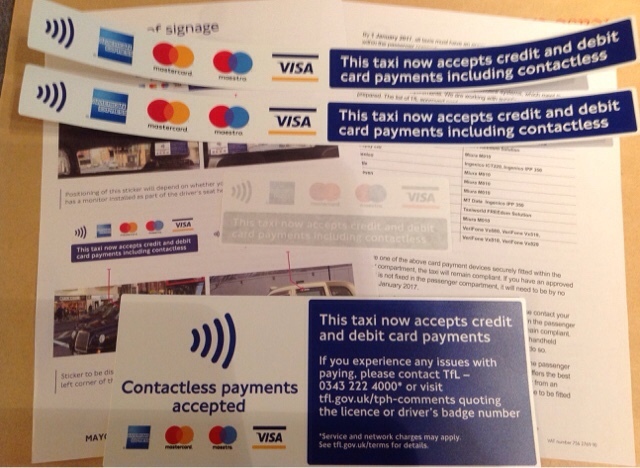 CONTACTLESS CARD FRAUD, ITS WHAT THE PUBLIC WANTS! MPs have put pressure on the Financial Conduct Authority to close a security loophole which allows criminals to make ‘tap and go’ payments on contactless cards months after they have been cancelled. The Commons Treasury select committee accused banks of placing customers in an ‘unacceptable situation’ of being vulnerable to fraud despite reporting their card lost or stolen. In a letter written to the committee and published today, the chairman of the Financial Conduct Authority, John Griffith-Jones, said the regulator is already working with banks to provide more protection for customers. He said measures being looked at include ‘removing any onus on customers to identify fraudulent transactions’, and working on bolstering banks’ systems to ‘reduce the likelihood of post-cancellation fraud’. He added that banks could also make the option of having a non-contactless card ‘more visible’ if a customer is concerned about the security risks. Banks typically issue contactless cards automatically when a card expires, or is lost or stolen, unless instructed otherwise. However, Barclaycard, Royal Bank of Scotland and NatWest only offer contactless cards, while Santander says customers can opt out of receiving a contactless card when they first apply. The security fears of contactless cards have increased as their popularity has soared. There are 101.8million in circulation, with spending more than tripling to £25billion last year. Their security flaw stems from the fact that contactless payments are automatically approved without the till connecting to the customer’s bank to check a card is valid. This one, TfL will revoke your Licence for displaying. The problem is compounded because most banks do not tell their customers when their cancelled card is used, relying on people trawling through statements to identify fraudulent payments before they can receive a refund. In a statement issued earlier today, the committee chairman Andrew Tyrie said it was ‘unreasonable’ to expect customers to ‘comb through their bank statements months after they have instructed their banks to block their lost or stolen cards’. He said the FCA needed to ‘sort this out’. A Barclaycard spokesman said: ‘Barclaycard does not offer non-contactless credit cards as we believe contactless payments are integral to ensuring our customers are able to pay conveniently, securely and quickly for small value items if they choose to use this function. 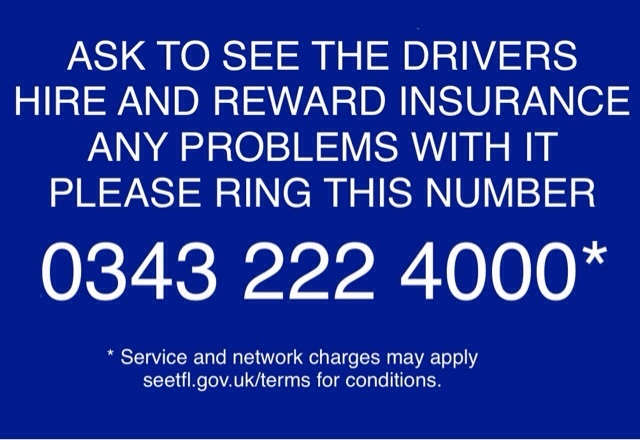 This is the sticker that should be displayed in every minicab throughout London. 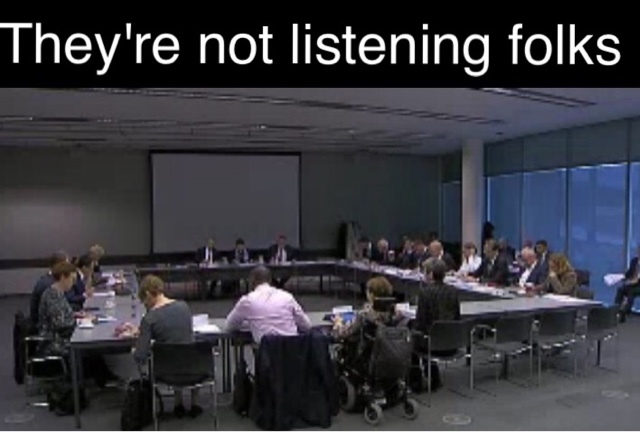 The TfL board meeting today was attended by Leon Daniels and Peter Blake. Item 13 on the agenda, review of taxi fares. No details discussed but Peter Blake said black cabs offer better value for daytime and short trips.... not so much for evening and longer trips. 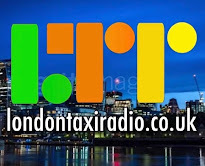 Ben Story mentioned the recent media coverage only in as far of the cost of new electric cabs and asked if the taxi review was taking the added 'cost plus' into account. Blake said "not as this stage". When asked how black cabs can compete against technology and Uber Blake said "TFL set the MAX fare to the meter and they are looking at ways for Taxis to offer fixed fares and prebooked cheaper fare". 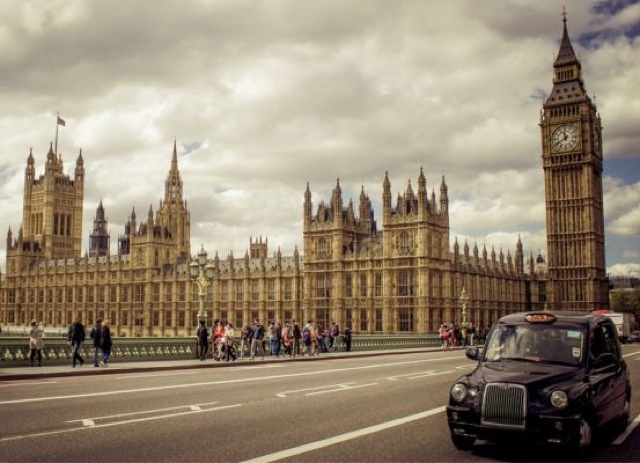 He went on to say the fare review hadn't taken into account the cost of the electric cab as part of their review, but over the next 12 months they will be looking at reducing operating costs against the capital cost of the vehicle. Not one word about the scandal concerning the illegal licensing of Uber, the Jamie Hawes court judgement, or the VAT crowdfunding case in the papers this week, they've just ignored all this. Lots of good news coming out this week. 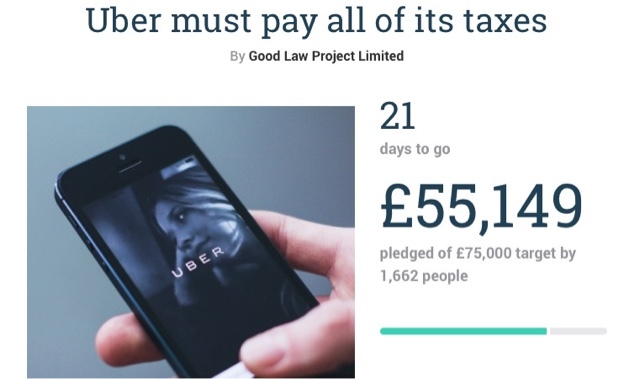 After a slow start, the crowdfunding appeal for Uber's VAT case started to accelerated after two massive pledges. Cash strapped drivers who are truely struggling, have dug deep and the fund is now racing on. 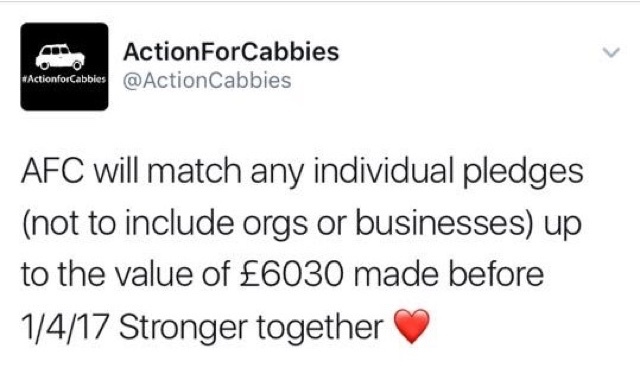 The escalation started with #Action4Cabbies initial pledge of £4,000, and a promise of more to come. This was followed on Saturday evening by CabVision's promise to match pledges upto the value of £10,000. #Action4Cabbies will today add another £6,030 to their initial pledge bringing their total to £10,030. We have also been formed that new kids on the blog 'TaxiApp' have donate £500. As of today, the crowdfunding total stands at £55,149, with 21 days left to go. If you care about the future of this trade, please pledge and help the fund reach its total. On top of Uber's massive PR disaster, currently coming out in the national news papers lead by the Daily Mail -publicising Downing Street's heavy handed involvement in the lobbying of previous Mayor Boris Johnson and TfL to "go easy on Uber"-we received news yesterday of the departure of Garret Emmerson from the TfL directorate. Lobbying, corruption, conflict of interests and backhanded job offers, it's all coming out now. One interesting case to hit the headlines these past few days, was that of Jamie Hawes' court verdict against TfL. Judgement has been made that Mr Hawes is owed £18 a day for being forced -under conditions of vehicle fitness- to advertise TfL's stakeholders. Also the court has ordered TfL to repay Mr Hawes Licence fee because of the conflict of contract involved with one of TfL's board members. 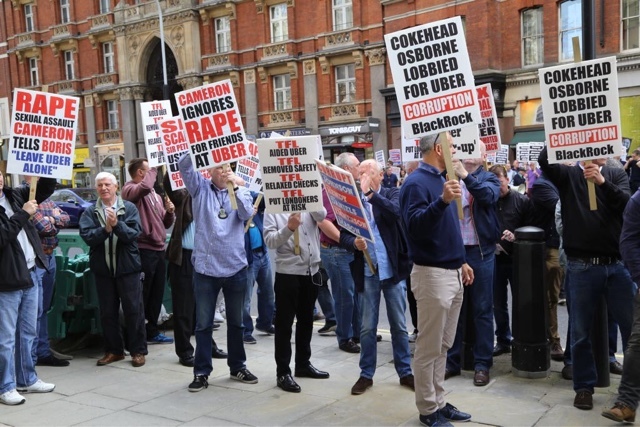 Yesterday, we are told on the LTDA Twitter account, at the APPG meeting in the House of Commons, Lord Blencathra said "Uber, the most vile form of capitalist company I've ever come across". It's been a long time coming, but it certainly looks like the tide has finally turned. This has been the best week our trade has seen for over 4 years..... and it's only Wednesday ! Today's mail will pour yet more petrol on the ubergate bonfire. Yesterday we read how uber repaid the prime ministers illegal lobbying of Boris Johnson by targeting its users and urging them to register to vote in the referendum. 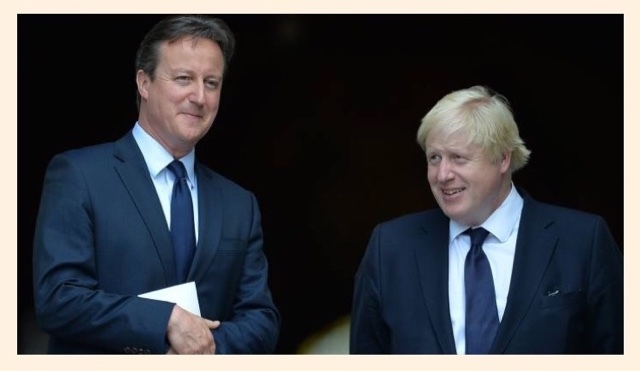 Osbourne offered a £650k a year position with Black rock for leaning on Johnson too. This is too big to not warrant a public enquiry. 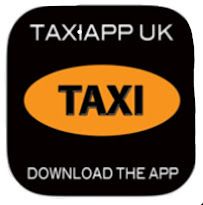 A British iconic industry killed off to accommodate an American app who pay no tax into our system. A few sacrificial lambs falling on their swords at TFL will simply not quench my thirst for the blood I demand. Thea says although her husband, 27, was calm about the situation, she complained to Uber - and received an "impersonal" response. An Uber spokesperson told Mirror Online the firm "does not tolerate any form of discrimination from riders or licensed drivers". They added that the driver says he waited for Thea and Jeremiah to exit the station but "eventually had to cancel the trip as he was causing an obstruction". However, Thea said: "It seems obvious to me that he was very racist. "There really could be no other explanation for why he would just drive off like that. "I requested an Uber as soon as we got off the coach and he gave me a call straight away to find out where I was. "When I came outside and he spotted me, he was really nice to me [as he remained on the phone] - very lovely. There was no problem. "My husband had all the suitcases and was lagging behind me, but he eventually came out and handed me one of them. "When we started walking towards the vehicle, the driver suddenly cancelled the job and left. We thought he was turning around at first, but he didn't come back. "He sounded completely nice on the phone but it was when he saw my husband. "[Jeremiah] is a tall black man. I don't know if the driver felt threatened. "My husband works with elderly people and a team leader at a care home. He's the sweetest, most gentle person ever. "I don't understand how we can allow these racist stereotypes to be perpetuated. 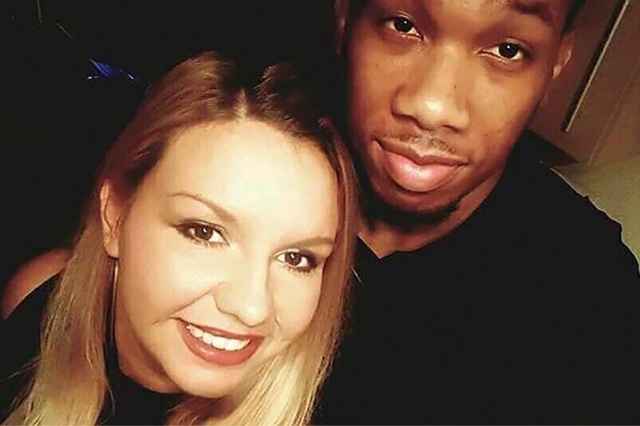 "When you are a biracial couple you see a lot of people who still have a problem, but it's still one of those things you don't expect to see in modern-day England." The couple, from Leicester, were in a rush to get to the airport after the minicab driver allegedly drove off without them. They ended up ordering another car via the app. Thea said: "The next minicab was also an Uber. "The driver didn't seem very surprised when we told him what happened. "The new driver was a young Arabic man and he seemed unfazed by it. "I'm just really disgusted. It's so messed up but Jeremiah is just used to it. We're both utterly baffled. "We live in Leicester and it's a very multicultural community - I'm not sure what Manchester is like but I wouldn't have expected this to happen." When Thea contacted Uber to complain about her experience, she claims she received a standard 'impersonal' response. Thea said: "Uber sent a reply to my complaint which was really impersonal and you can see that they haven't actually read it properly. "It said: 'thank you for your advice. We will take this into consideration when we are doing our next recruiting'. "After that, they have messaged me saying that basically, because of driver security, they cannot disclose what will happen but they are going to investigate. "I asked them when it is concluded, if will they let me know what happens but they said they can't do that either. "They said the minicab driver was suspended whilst they carried out the investigation. "I really want for Uber and the driver to take responsibility and would really like people be more aware that their actions have consequences and society needs to change." A spokesperson for Uber told Mirror Online: "Uber does not tolerate any form of discrimination from riders or licensed drivers who our the app. "We have spoken to this licensed driver who strongly denies these claims. "He has told us that he waited for the passengers to exit the station but eventually had to cancel the trip as he was causing an obstruction." A Downing Street spokesman insists that any suggestion of a cover-up is "categorically untrue". 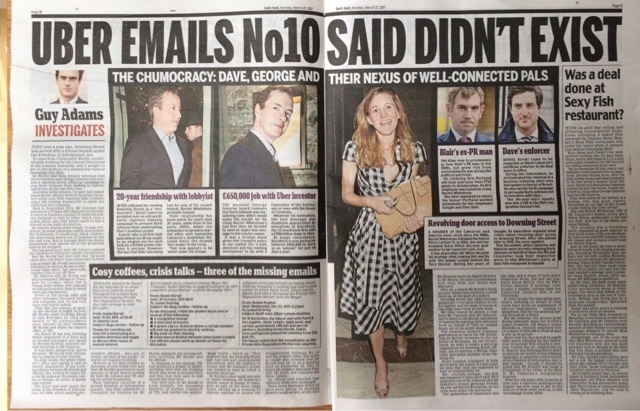 The Daily Mail's front page carries allegations of a "cover-up" involving David Cameron's advisors and the Uber online taxi firm. 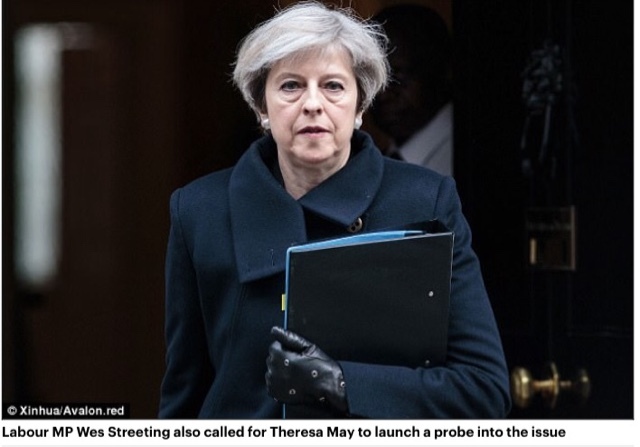 The Mail further claims that Downing Street did not hand over details of the alleged lobbying operation when asked to do so, under a freedom of information request - although they later emerged from Transport for London. An Urgent Call For A Public Inquiry Into TfL... Every Driver Needs To Complete This Request. On Friday 6th January 2017, a meeting took place with the Prime Minister Theresa May, asking for a public inquiry into Transport for London (TfL). 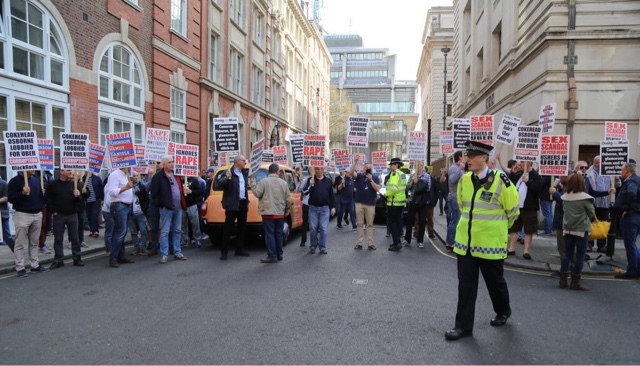 With the help of the Taxi trade organisations, Mrs May was handed documents to back up the London Taxi drivers request. As London Taxi drivers, we need to put pressure on the Prime Minister to grant a full public inquiry into TfL. You can help by completing a short form to send this pre-written and personalised email to your local MP. This has been written from your perspective as a London Taxi driver on how you have been affected by the governments and TfL's malfeasance. In addition to this, we would highly recommend you request a visit to their constituents surgery to personally ask for assistance. 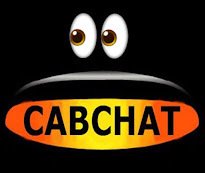 Please click on link below to be taken to the Point Cab Page. Submit postcode, then follow instructions (it only takes a minute to complete. This email will be sent to your MP. The iconic black cab is under threat and as one of your constituents, I am asking you to help avert this disaster. It took me around 3 and half years of self-funded studying to earn the right to Ply 4 Hire as a licensed taxi driver. 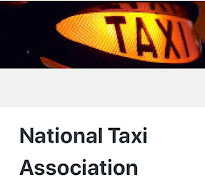 The licensed London Taxi trade gives people the opportunity to fulfil their hopes and aspirations. It is also a great equaliser that rewards endeavour over privilege. I worked hard to attain my license, and to purchase the prescribed purpose built vehicle that TfL says I must use to work as a taxi driver, and I contribute to the UK economy as a self-sufficient sole trader. I didn't foresee fighting an unjust battle against a global multi-national corporation in Uber. More-so, I never imagined that the company would have close personal links with the (former) PM and TfL would bend over backwards to embed them into the system. 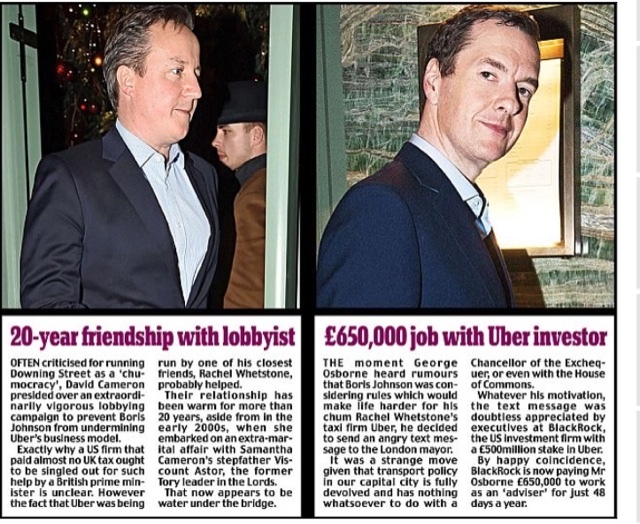 David Cameron and George Osborne are named in these two stories from the Daily Mail, detailing their extremely close links to Uber. This has led to many calling the situation corrupt and malfeasance by 10 Downing Street. Uber Technologies Inc. has a rapacious predatory pricing policy intended solely to annihilate the lives of individuals who, like me, fulfil every one of TfL’s licensing requirements. Amidst all of this, and despite Uber Technologies Inc. being valued at $64B, they choose to domicile their tax affairs in the Bahamas via the Netherlands. I find it outrageous that hard working tax payers are shouldering the burden of a company that disregards our democratic constitution. I am further outraged that our government, policy-makers and regulators continue to facilitate nefarious practices that are injurious to law abiding citizens. This is nothing short of malfeasance. It matters not if their service is favoured, no one should advocate covert political agendas engineered to displace a legitimate workforce using an illegally licensed one. I am perpetually reminded that I should welcome a free market, after all, it's the customers right to choose? However, what we are experiencing is the antithesis of a free market. In short, it is a state enabled take-over of a regulated trade. Effectively, TfL continue to facilitate Uber to flood the streets of London despite unsustainable congestion and pollution recorded at 5 X the EU limit. Even though my vehicle conforms to the EU 5 emissions strategy, from next year, I'm expected to help clean the air quality by purchasing the new Zero Emissions Capable Taxi costing in excess of £45,000. How can this be considered as anything other than a stealth drive into Bankruptcy. The Mayor of London is ultimately accountable for TfL’s performance and conduct, and is answerable to the London assembly. The London Assembly are able to carry out investigations into TfL’s activities and there are a number of recorded cases where this just isn’t working. TfL is documented lying to the GLA regarding public hire insurance and licensing requirements. TfL management versed Uber on ‘terminology’ to avoid regulatory implications, via email, telephone and ‘coffee shop’ meetings. TfL state assisted Uber in the high court by robustly defending their modus operandi when seeking a ruling to define what constitutes a taxi meter? TfL Senior management are aware that Uber’s business model never satisfied the 1998 PH regulations. TfL Senior management have moulded secondary legislation to accommodate Uber’s business model. The GLA’s Future Proof (Taxi and Private Hire Services in London) noted cross party support for 19 recommendations. None of which have been addressed. An undercover report by The Sun newspaper found PH drivers were obtaining fraudulent medicals. 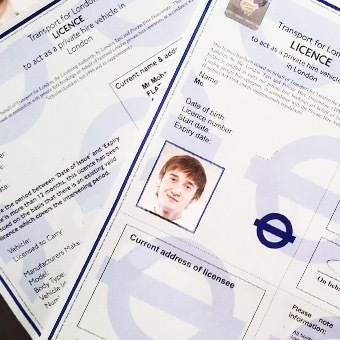 A report carried out by Theo Usherwood highlighted how easy it is to obtain a PHV license without the correct paperwork. Please treat this letter with appropriation and the uppermost seriousness by writing to the Prime Minister, Theresa May with my request for a genuine and transparent public inquiry into Transport for London. Please can I have copies of their reply. 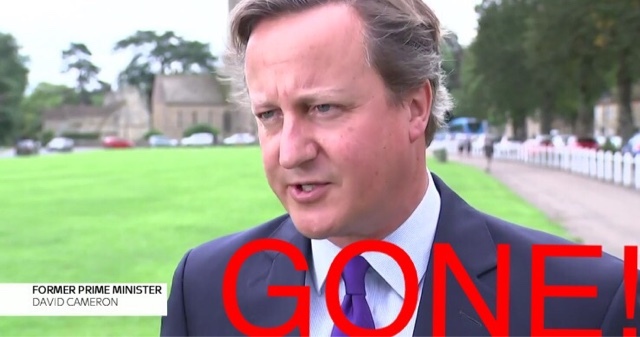 David Cameron may have stood down as PM and MP....But, we'll never forget what he did ! Remember David Cameron, the failed Prime Minister of Great Britain who slunk away from public life last year amid the chaos of Brexit? The man who will be remembered for being, among other things, the utter git who reportedly decided to hold the Brexit vote in a Chicago airport pizza restaurant? Well, he’s in the news again: The Financial Timesreports that he encouraged the mayor of London to drop proposed regulations against Uber. The kicker, as the Times suggests, is that Cameron’s reported advocacy on behalf of Uber is even more suspect given his close ties to the company. His former strategy chief, Steve Hilton, is married to Rachel Whetstone, who does communications and public policy for Uber. Whetstone was hired at Uber in May 2015; the reported texts from Cameron were sent in late 2015, according to the Times. The Times quotes an unnamed City Hall official who said that the alleged conversations included “making arguments about free markets and competition.” (Sounds riveting!) News of the texts was first reported by the Daily Mail, who filed a Freedom of Information request for the communications. 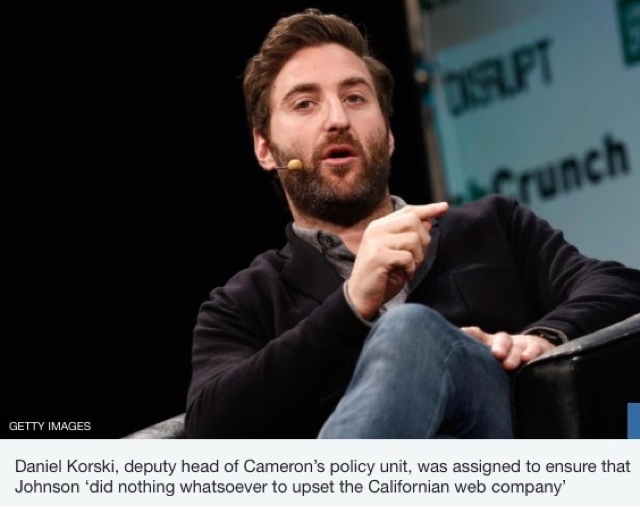 When asked about Cameron’s involvement, an Uber spokesperson wouldn’t say much, and instead sent Gizmodo a statement criticizing the rules Cameron supposedly argued against. A request for comment to 10 Downing Street wasn’t immediately returned, but we’ll update if we hear back. Of course, for a man who still receives almost daily tweets calling him a “pig f@@@er” or saying he got “a blowy from a pig,” things surely can’t get much worse. 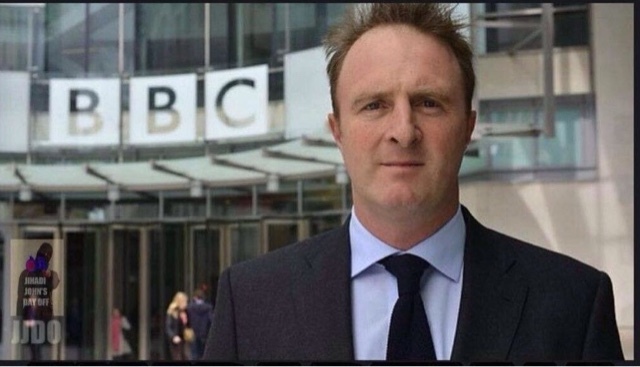 Garret Emmerson has decided to quit his £184,999 job as Cheif Operating Officer For Surface Transport just days after he #Ubetgate scandal broke in the daily mail. News broke last night that one of TfL's top staff had resigned and a crisis meeting of the directors was called. Garrett departure was confirmed this morning by TfLTPH General Manager Helen Chapman. An internal memo had been circulated to TfL staff his morning from Leon Daniels, Managing Director of Surface Transport, announcing the departure of Garrett Emmerson and confirmation was made around midday. I am sad to announce that Garrett Emmerson, Chief Operating Officer for Surface Transport, will be leaving us. Meanwhile on a train to Brussels Mayor Sadiq Khan was interviewed by LBC, in the light of the story which has been breaking in the Daily Mail and Financial Times, concerning Downing Street leaning on the previous Mayor Boris Johnson, to go easy on the San Francisco based minicab booking app, even though they didn't meet the strict regulations other minicab operators have had to meet. The saga continues and is far from over as rumours abound that a second high profile member of TfL has also resigned....more news as and when it becomes confirmed. It's getting serious now, as the financial times has also carried the ongoing saga of #Ubergate. A TfL insider source has told Taxi Leaks that top directors from surface transport, were called to a crisis meeting yesterday. It's been alleged that so far, one TfL director has resigned. Helen chapman has just confirmed that indeed, Garret Emmerson has resigned. Worries are now spreading throughout the management of the possibility that some may face legal action, over their role in the relaxation of legislation to allow an app based platform to be licensed. As they say though, it's not over, till its over and I've been told there is so much more to come with #Ubergate. • Are guilty of product placement by continued mention of the Uber brand on TV shows??? 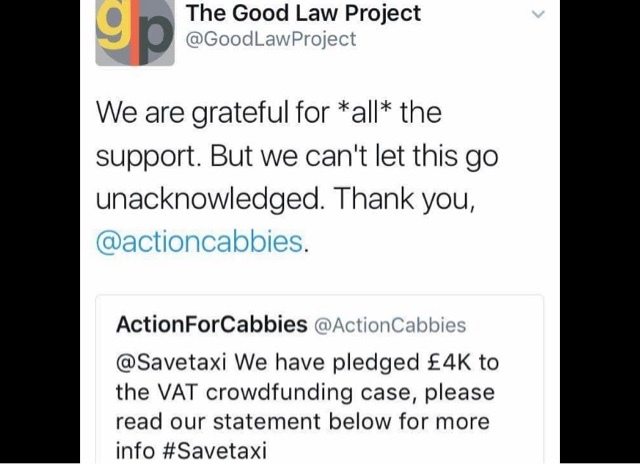 Grant Davis, chairman of the LCDC has made a direct plea to the trade to support the Crowdfunding case of Jolyon Maugham QC. 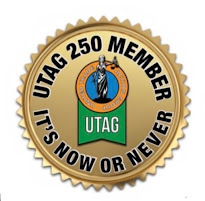 Please drivers, if you are not in an Org, please think about the Club. We are just passionate drivers who want to keep our jobs. "The RMT are calling a meeting to discuss the crowdfunding and Uber's renewal". STATEMENT FROM THE ITA: PROTEST! 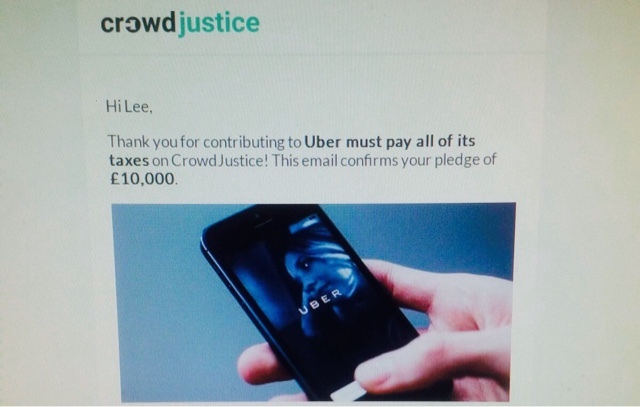 AGAINST GOVERNMENT AND UBER CORRUPTION! PROTEST AT THE CONSERVATIVE PARTY HQ ON THURSDAY. PROTEST! AGAINST GOVERNMENT AND UBER CORRUPTION! 11:00 Thursday 30 March 2017. Matthew Parker Street. BE THERE IF YOU CARE!!! 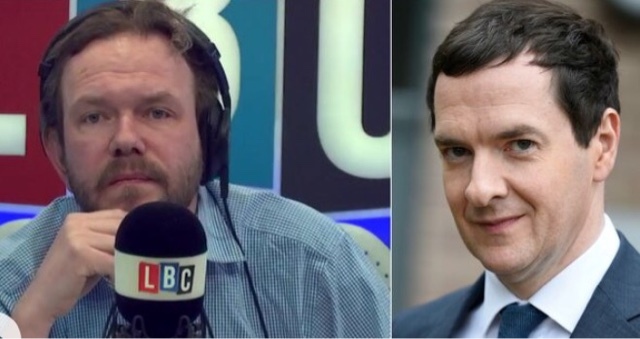 George Osborne's email to Boris Johnson over Uber made James O'Brien "sick to his stomach". And either you'll feel the same, or you're on the payroll. The former Chancellor wrote an email to Boris Johnson, asking him to ease off restrictions which made it harder for Uber to operate. He said: "The moment George Osborne heard rumours that Boris Johnson was considering rules which would make life harder for his close friend Rachel Whetstone, he sent an angry text message to the London Mayor." Saying that he was about to read the Daily Mail article word-for-word, he added: "If you find my politics problematic in the past, just have a listen to this. "Anybody who doesn't feel sick to their stomach about these words has got something wrong with them. Or they're on the payroll." 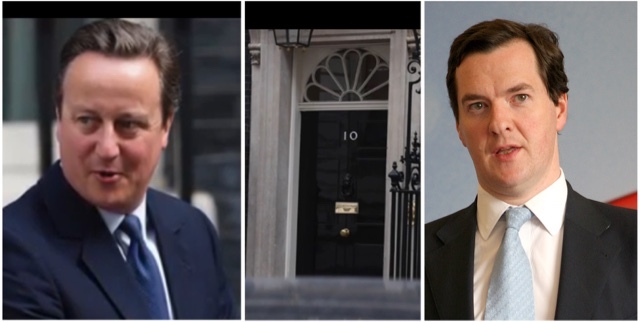 Downing Street had failed to divulge details of the alleged lobbying operation. 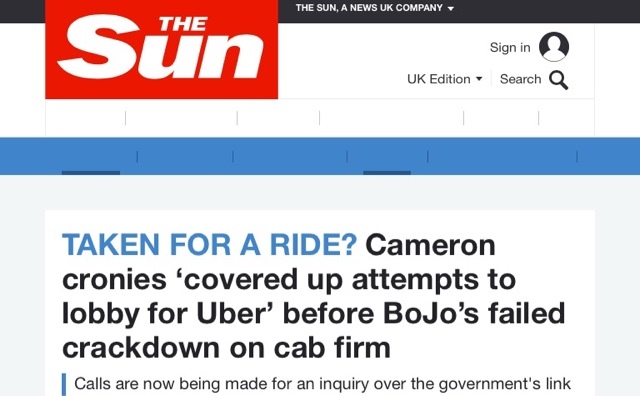 David Cameron's Downing Street was accused of a blatant cover-up last night over failed plans to crack down on Uber. 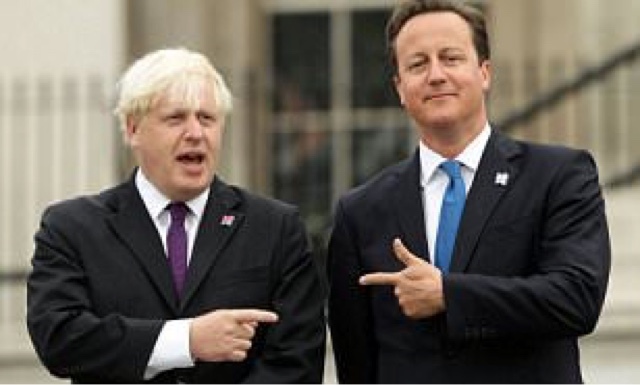 The ex-PM and George Osborne allegedly told aides to lobby Boris Johnson against curbs on the online taxi firm. The Daily Mail revealed on Saturday that a No 10 adviser swapped emails with senior staff working for the then London mayor. 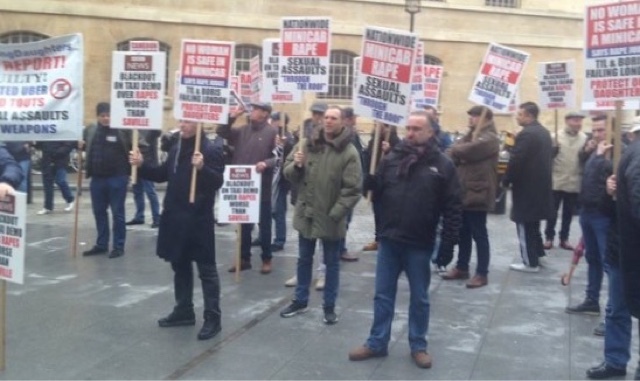 Great support for the London Licensed Taxi trade from MP Wes Streeting and Caroline Pidgeon. Sources : Daily Mail and The Sun. Taxi Leaks would like to thank Dave Davies for all the work he's put in to getting this story into the media. 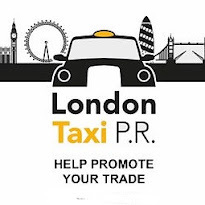 We would also like to thank the LCDC for their contribution and the work they've put into this on behalf of the trade. TfL directors, under pressure from Downing Street, licensed a company who didn't meet with regulations. They subsequently changed the regulations to fit with this companies MO. 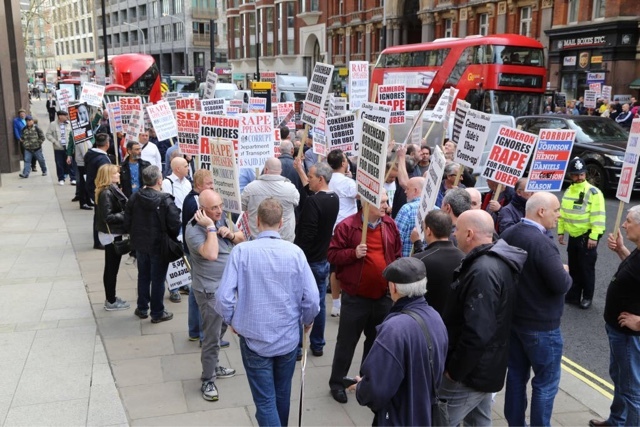 Top directors at TfL have not only put the public in danger, they have almost destroyed the livelihoods of many licensees from the Taxi and Private hire trades. Not only should these directors be sacked, they should also be prosecuted for malfeasance.